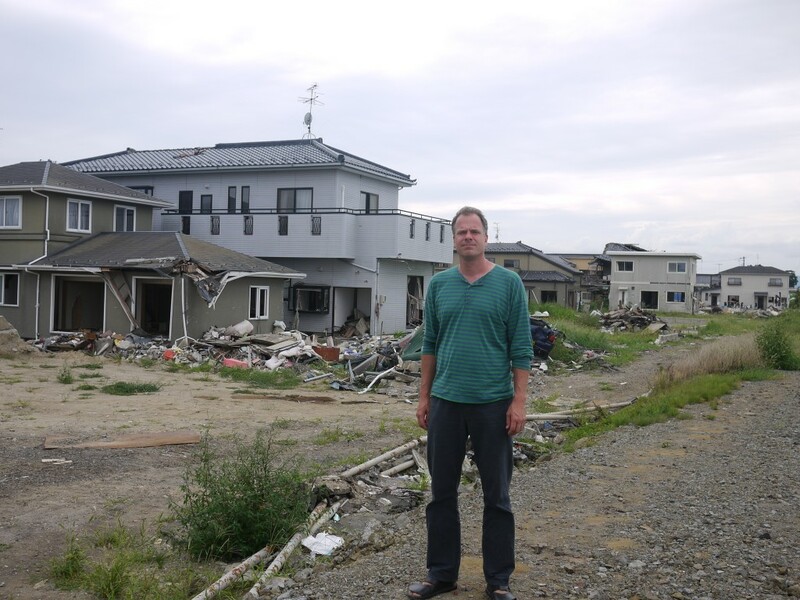 On Aug 18, I made my way to Fukushima City and then headed toward the cost with Billy McMichael from Fukushima Univ. After some hours of volunteering, Bill was kind enough to drive me to the cost to see some of the devastated communities there. I felt a bit uneasy as a bit of a “disaster tourist”, but I’ve spoken to several people from Tohoku since then and they are actually very eager for visitors to see the current situation which made me feel a bit better about visiting. Before I even arrived in Fukushima, I noticed from the Shinkansen, especially in Koriyama, that many of the houses looked like they had blue tarp “band-aids” on their roof. I first couldn’t quite figure out what was going on, especially since I kept seeing more and more tarps weighed down by big rocks, but one particular house made the explanation quite obvious, i.e. individual roof tiles that had been dislodged in the earthquake or aftershocks and holes that were now covered up to keep the rain out. Billy confirmed that Koriyama had seen much more severe shaking than Fukushima City, due to differences in the rockbed in their specific locations. The next things I noticed in the drive toward Soma city that Japan really is quite jungly in the summer. I had not been here in July-August since the late 1990s, having simply avoided travel to Japan during this hot and humid season. With frequent visits in the late Fall and early Spring, my mental image of Japan had slowly become that of dry rice paddies or bare trees. Summer is not that by any stretch. I mention this because the verdant growth everywhere clearly has begun to cover up some of the earthquake/tsunami scars. This vegetation cover lends some areas an immediate air of normalcy as it requires at least a second glance to notice signs of the recent destruction. I saw an unusual number of freshly planted sunflower beds. It appears that the fast weed-like growth of the sunflower means that it absorbs some of the cesium out of the ground (can anyone speak to this with any expertise? ), but I wonder what will happen to the dry plants at the end of the Fall. Certainly no dumping of radioactive sunflowers in my backyard! When we came closer to the coast in Soma (some 15km or so from the radiation exclusion zone), some大 震災 damages became more visible quickly. It was very obvious quickly that a massive clean-up effort is under way on the Tohoku coast. Backhoes dotting the landscape as far as the eye can see in affected areas. Clearly, construction and clean-up crews are busy and this must be an economic relief as it also must offer employment opportunities to local residents who may have lost their livelihood in the 大震災. For example, towns that are within commuting distance from the No. 1 nuclear plant may be suffering from the after-effects of the 大震災 and the on-going nuclear crisis, but their harbours as well as the many jobs associated with the two large nuclear complexes in Fukushima have also been eliminated. Most of the clean-up effort currently seems to be directed at scraping debris together into large piles for later disposal. In residential areas near the cost, this means that all that remains are foundations. Having visited coastal towns like Soma and Shinchi in the past, I can imagine what these residential areas may have looked like before the 大震災, but entire streets with mere foundations in place certainly do not look like vibrant coastal towns. In most areas, there are often individual structures that remain standing, though typically with broken windows or otherwise damaged. I can only imagine that specifics of topography may have redirected Tsunami water masses away from such structures to allow them to remain standing. Clearly, some houses have chunks taken out of them where something else must have smashed into them. The closer to the shore and the further up north, the more visible debris and damage I saw. We ended up driving past Sendai to Natori (名取) where the clean-up is in full swing but hasn’t progressed as far as further South. There are still lots of boats and other debris in rice patties and some neighbourhoods are still standing in their destroyed states. We got out of the car near this spot to walk around a little and apart from the obvious destruction to houses, a lot of the human losses were also immediately visible when walking around. We found house keys, toys, and insurance ID of some kind, simply strewn about, who knows where it was from the immediate area or from much further away. While the immediate visible impact of the destruction is already powerful, it is when thoughts turn to the people and their suffering that it becomes quite overwhelming. 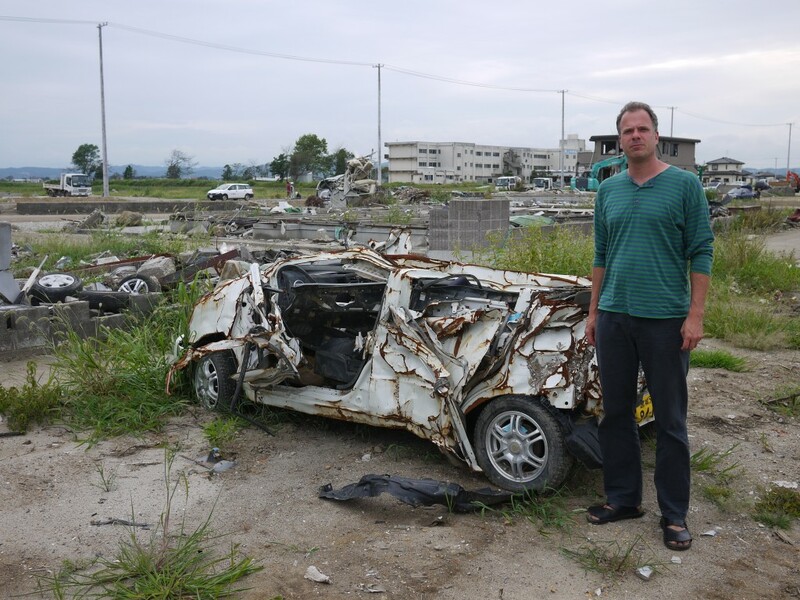 One of the more startling visual clues to the power of the tsunami is the highly compacted cars that can be found everywhere. The car in the picture was a ミニカー as made clear by the yellow plates, but that refers to the size of the engine, not necessarily of the car body. Driving toward Sendai we saw lots of stretches of dry, salty rice paddies with the earth cracking is is usually seen in pictures of droughts. The contrast with the jungly vegetation everywhere else was particularly stark in these areas. Clearly, the on-going clean-up and reconstruction on the Tohoku coast will take years. What long-term damage has been caused to the local population beyond their immediate material losses, we’ll only likely know in decades. This entry was posted in Japan, 東日本大震災. Bookmark the permalink.